While pondering what I might give my brother for the holidays this year, I looked up and and saw an open tab for Roasted Hazelnut Butter. A definite omen, my first purchase, oh my. I was reminded of the days when as a very young wife I could call up Payton's Market and order my groceries and they would bring them to my door. That seems to be coming round again, though I liked it better first time round. The turkeys in the window are dancing their butts off today, inspired by the lovely day no doubt. I went out and found the kale to be in great shape and cut some for some soup. The herbs are looking good too and I loved being able to cut some fresh thyme. Realizing just now that I didn't look at the spinach and chard under the plastic in the raised bed. Perhaps the husband will do that. He's totally in my good graces at the moment having given me 4 stainless steel ice trays for my birthday which isn't even here yet. I've wanted those trays for a long time, love them! And, I think he ordered me a new tablet as mine is having charging issues. I would have just put up with it, but he is always buying new electronic devices for both of us. He spends a lot of time on his desktop, but today he's out blowing the leaves into piles for later pickup and inclusion in his gardening process. 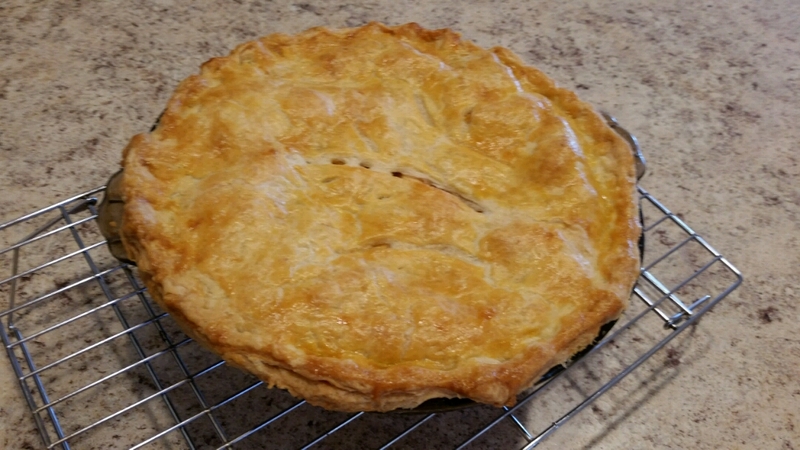 I made an apple pie this morning. Not for us though, for some doctor where my youngest works; and I'm not even certain if it's a bday thing or what, but it's made and checked off my list. I also managed to get all the houseplants watered. Yeah me! Yesterday I walked. Today my back hurts. Hmmm.. Not walking today, glad to be finished with all tasks that require me to remain upright. Today among available networks I saw a DEA Drone listed. Interesting. I can only hope they are becoming interested in what might be a meth lab in the hollow. Still, I don't like it that they are spying on us from the sky. If they're watching or listening to me, they are pretty bored. Time for relaxation, another episode of Brideshead..., a bath, who knows. I started a new book, another in the Ian Rutledge series by Charles Todd, set in the same time frame as Woolf and Waugh write about and lived in, but by no means is it literature. Your pie looks absolutely yummy! I hope that everything went okay with your back and all your tasks today! Oh yeah, got everything done and even found time to knit. Wow, you are way more organized that I am. Whenever I have a list like that, I usually meet myself going.